Historic windows can mean many different things depending on the desired look and the local agency requirements. The degree of historical significance can mean one particular historical window element such as the trim shape or glazing bead or it could be deemed to have the same window materials ie: wood or steel framed. 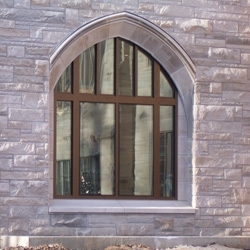 Windows in historical buildings are often required to be rehabilitated or replaced with products that simulate the look in configuration and material type with similar sight lines to keep the character of the building. Flower City Glass has been involved with several projects that have historic window requirements and are familiar with State Historic Preservation Office (SHPO) requirements for historic structures in New York State. We have assisted in the design of special details and worked with many window manufactures to create custom features and profiles to meet State Historic Preservation Office requirements. Using wood, aluminum or steel sash windows we can meet most any historical requirement with new windows that are not historically poor energy performers. Modern windows made with energy efficient products will look elegant and perform to current energy code standards. Request a quote or contact us for more information on historical windows or historic window replacement.